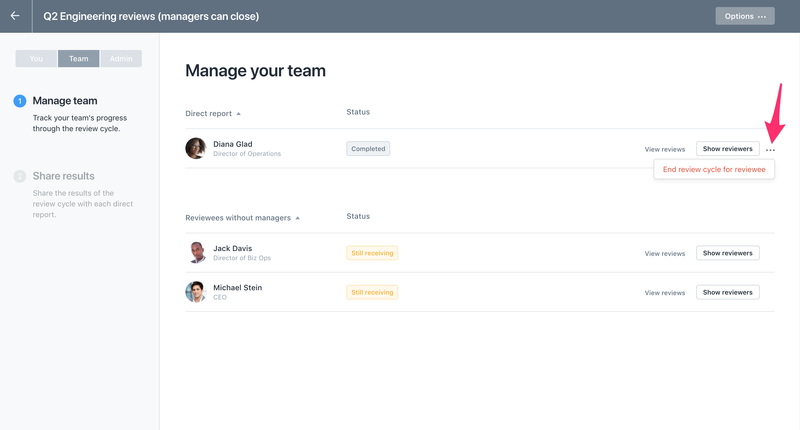 For certain review cycles, admins can give managers the permission to end the review cycle for their direct reports. As a manager, this means that rather than waiting for the entire review cycle to end (when all reviews have been submitted for a direct report), you can end a review cycle yourself and immediately share the results. To end the review cycle for one of you direct reports, you have two options. 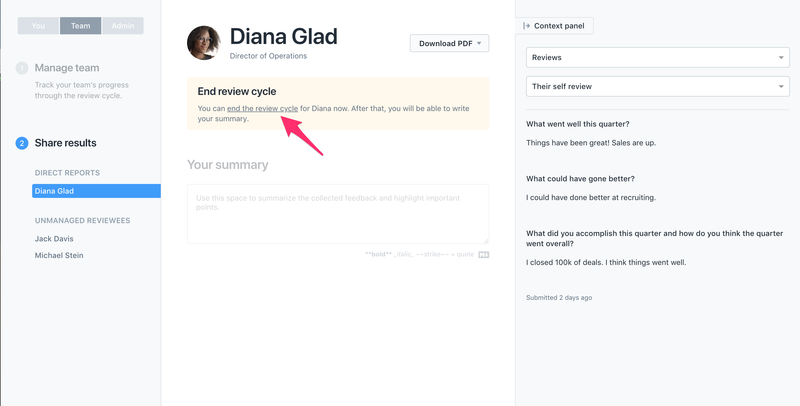 Option 1: Navigate to the the review cycle under "Your Team"
Find the direct report you'd like to end the review cycle for under the "Share results" section. Click on "end the review cycle" to end. Find the direct report you'd like to end the review cycle for, and click on the ellipses next to their name. From the drop-down menu, select "End review cycle for the reviewee." Once this is done, you'll immediately have the ability to write your summary remarks and share the review with your direct report. I can't (there is no option to) close the review cycle for my direct report! We currently don't allow review cycles to be closed early until all reviews have been submitted. This means that you, your peer, your direct report and your own manager's reviews must be submitted before you can close the review cycle. To check who hasn't submitted a review yet, you can click the "Show reviewers" button on your Manage Team page. If this is an issue, please reach out to your Lattice admin. They can close the review cycle for your direct report without these restrictions!